1 In the vSphere Client inventory panel, select a virtual machine and select Edit Settings. 2 Select the Resources tab and select Advanced CPU. 3 Click the Run on processor(s) button. 4 Select the processors where you want the virtual machine to run and click OK.
By specifying a CPU affinity setting for each virtual machine, you can restrict the assignment of virtual machines to a subset of the available processors in multiprocessor systems. 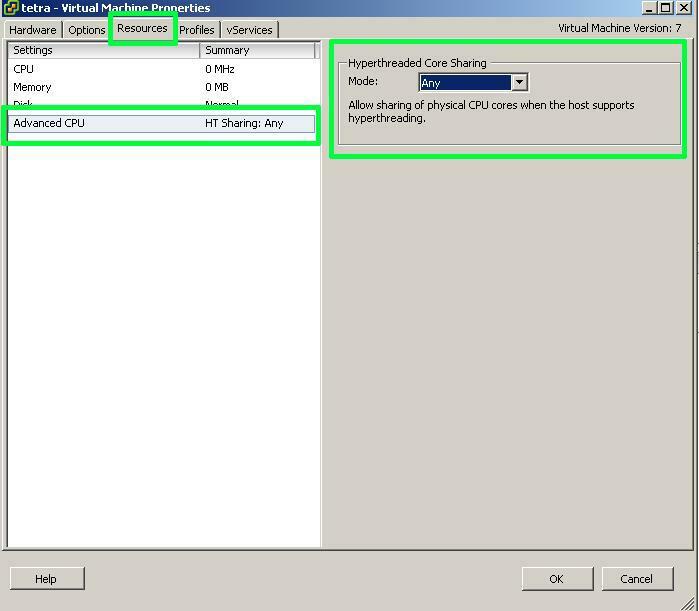 By using this feature, you can assign each virtual machine to processors in the specified affinity set. CPU affinity specifies virtual machine-to-processor placement constraints and is different from the relationship created by a VM-VM or VM-Host affinity rule, which specifies virtual machine-to-virtual machine host placement constraints. In this context, the term CPU refers to a logical processor on a hyperthreaded system and refers to a core on a non-hyperthreaded system. virtual machine with affinity to only two CPUs. For the best performance, when you use manual affinity settings, VMware recommends that you include at least one additional physical CPU in the affinity setting to allow at least one of the virtual machine's threads to be scheduled at the same time as its virtual CPUs. Examples of this include a uniprocessor virtual machine with affinity to at least two CPUs or a two-way SMP virtual machine with affinity to at least three CPUs.